With Genode 18.08, we enter the third episode of the story of Sculpt, which is our endeavor to shape Genode into a general-purpose operating system. In the first two episodes, we addressed early adopters and curious technology enthusiasts. Our current ambition is to gradually widen the audience beyond those groups. The release reflects this by addressing four concerns that are crucial for general-purpose computing. First and foremost, the system must support current-generation hardware. Section Device drivers describes the substantial update of Genode's arsenal of device drivers. This line of work ranges from updated 3rd-party drivers, over architectural changes like the split of the USB subsystem into multiple components, to experimental undertakings like running Zircon drivers of Google's Fuchsia project as Genode components. Second, the steady stream of new discovered CPU-level vulnerabilities call for the timely application of microcode updates. Section New Intel Microcode update mechanism presents a kernel-agnostic mechanism for applying CPU-microcode updates to Genode-based systems. Third, in order to be actually useful, the system needs to be scalable towards a vast variety of workloads. Genode's VFS infrastructure is a pivotal element here - it is almost like a Swiss army knife. For example, Section New VFS plugin for using LwIP as TCP/IP stack presents how the VFS enables the lwIP and Linux TCP/IP stacks to be used interchangeably for a network application by merely tweaking the component's configuration. The VFS ultimately enables us to host sophisticated 3rd-party software, like the new port of Python 3 (Section Python 3). Also on account of workload scalability, the release features a new caching mechanism described in Section Cached file-system-based ROM service. Fourth, to overcome the perception of being a toy for geeks, Sculpt must become easy to use. We are aiming higher than mere convenience though. We ought to give the user full transparency of the system's operation at an intuitive level of abstraction. The user should be empowered to see and consciously control the interaction of components with one another and with the hardware. For example, unless the user explicitly allows an application to reach the network, the application remains completely disconnected. Founded on capability-based security, Genode already provides the solution on the technological level. Now, we have to make this power available to the user. To make this possible, we need to walk off the beaten tracks of commodity user interfaces. Section Sculpt with Visual Composition gives a glimpse to the upcoming features and future. Besides the developments driven by Sculpt's requirements, the current release features an extended Ada language runtime, updated kernels, new multi-processor support for our custom microkernel on x86, and the ability to route network traffic between an arbitrary number of physical network interfaces. New verbosity class "packet drop"
Sculpt is our take on creating a Genode-based general-purpose operating system. With the Year of Sculpt as our leitmotif for 2018, the current release features the ingredients of the third evolution step advertised on the road map. With Sculpt VC (Visual Composition), we pursue the gradual transition from a text-based user interface to a graphical user interface for most administrative tasks while preserving the text-based interface for the full flexibility. All packages for the current version of Sculpt are readily available at https://depot.genode.org/genodelabs/. The official disk image of Sculpt VC will be released in September. The central element of Sculpt's envisioned graphical user interface will be an interactive representation of the runtime state, giving the user an intuitive picture of the relationship between components and their respective trusted computing bases, and thereby a sense of control that is unknown from today's commodity operating systems. The runtime view is generated on the fly and updated whenever the system undergoes a structural change. It is organized such that components with a close semantic relationship are grouped together. By default, the most significant relationship between any two components is highlighted by a line connecting them. The runtime view already supports a basic form of interaction: By clicking on a component, all relationships to other components of the runtime become visible, and additional details about the resource usage are presented. In the forthcoming versions, the graph will become more and more interactive. Within Sculpt's leitzentrale, the runtime view is now displayed by default. However, when inspecting file systems, the runtime view is replaced by the inspect window. Both views can toggled by clicking on the title of the storage dialog for the inspect window, or any other dialog for the runtime view. In its current incarnation, the deployment of components is directly controlled by editing the /config/deploy file of Sculpt's config file system. With the move to a non-textual user interface, this responsibility will be handed over to the sculpt-manager component. To make this transition possible, we moved all manually-defined parts of the deploy configuration to so-called "launcher" configurations that reside at /config/launcher/. The deploy configuration merely controls the instantiation of components while referring to launchers. The name of each launcher corresponds to its file name. That said, the deploy configuration is backwards compatible. Whenever a <start> node contains a pkg attribute, it still works as before, not using any launcher policy. In the new version, the default deploy configuration contains just a list of nodes, each referring to a launcher according to the name attribute. It is possible to explicitly refer to a differently named launcher by specifying a launcher attribute. This way, one launcher can be instantiated multiple times. A <config> node within a launcher - when present - overrides the one of the pkg. In turn, a <config> node within a node of the deploy config overrides any other node. Both the launcher and a <start> node may contain a <route> node. The routing rules defined in the <start> node have precedence over the ones defined by the launcher. This way, the routing of a launcher can be parameterized at the deploy configuration. 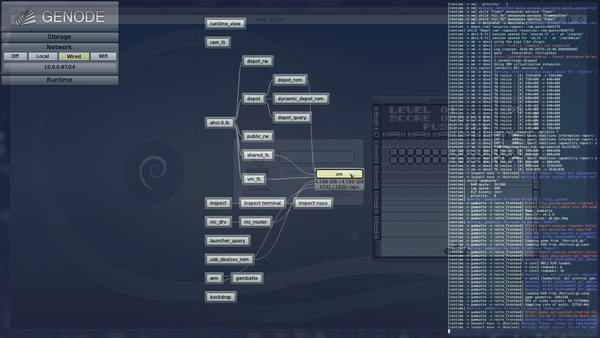 The files at /config/launcher/ are monitored by the sculpt manager and therefore can be edited on the fly. This is especially useful for editing the <config> node of /config/launcher/usb_devices_rom to pass USB devices to a virtual machine. The new report_dump subsystem periodically copies the content of Sculpt's report file system to the default file system. It thereby can be used to turn Sculpt into a diagnostic instrument for probing the driver support on new hardware. First, a USB stick with a fresh Sculpt image is booted on a fully supported machine. The user then customizes the USB stick within the running system by expanding the USB stick's Genode partition, setting it as the default storage location, and deploying the report_dump subsystem. The last step triggers the installation of the report_dump package onto the USB stick. Finally, the user copies the deploy configuration from the in-memory config file system (/config/deploy) to the USB stick (/usb-<N>/config/18.08/deploy). When booting this prepared USB stick, this deployment configuration becomes active automatically. At this point, the Sculpt system will copy a snapshot of the report file system to the Genode partition of the USB stick every 10 seconds. The snapshots captured on the USB stick can later be analyzed on another machine. The snapshots not only contain all log messages (/report/log) but also the reports generated by various components of the drivers subsystem and any other deployed components. E.g., with acpica present in the deploy configuration, the battery state is captured as well. The report-dump subsystem nicely showcases how the addition of a simple package allows the reshaping of Sculpt into a handy special-purpose appliance. We updated our DDE Linux version from 4.4.3 to 4.16.3 to support newer Intel wireless cards as well as Intel HD graphics devices. Since there were changes to the Linux internal APIs, we had to adapt the Linux emulation environment. We managed to do that in a way that still makes it possible to keep using the old Linux version for certain drivers like the FEC network driver and the TCP/IP stack, which will be updated in the future. Furthermore, some drivers received additional features while updating the code base. By default the brightness is set to 75 percent. The connector status report also includes the current brightness of supported displays for each status update. The update of the iwlwifi driver's code base brings new support for 8265 as well as 9xxx devices. The WPA supplicant code was also updated to a recent git version that contains critical fixes for issues like the KRACK attack. We took the update as an opportunity to rework the wifi_drv's configuration interface. The old driver used the wpa_supplicant.conf POSIX config-file interface as configuration mechanism. Unfortunately, this implementation detail became apparent to the user of the driver because a file-system for storing the file needed to be configured. For this reason, we now make use of the CTRL interface of the supplicant and implemented a Genode-specific back end. In this context, we refined the structure of the configuration of the driver. The driver still reports its current state but the report is now simply called state instead of wlan_state. At the moment, SSIDs are provided verbatim within the report and are not sanitized. SSIDs that contain unusual characters like " and the NUL byte will lead to invalid reports. This also applies for the accesspoints report that supersedes the former wlan_accesspoints report. We will address this remaining issue in a future update. The connected_scan_interval specifies the timeout after which the driver will request a new scan of the existing access points when connected to an access point. This setting influences the frequency at which the driver will make a roaming decision within the network (SSID). The scan_interval attribute specifies the timeout after which a new scan request will be executed while still trying to find a suitable access point. In addition to those attributes there is the use_11n attribute that is evaluated once on start-up to enable or disable 11N support within the iwlwifi module. It cannot be toggled at run-time. Furthermore there are various verbosity attributes like verbose and verbose_state. If either of those is set to yes, the driver will print diagnostic messages to the log. The verbosity can be toggled at run-time. It is now also possible to temporarily suspend the radio activity of the wireless device by setting the rfkill attribute to yes. This will disable all connectivity and can be toggled at runtime. The <accesspoint> node replaces the previously used <selected_network> node. The SSID of the preferred network is set via the ssid attribute. Like the SSID in the driver's report, its value is copied verbatim. At the moment, there is no way to express or escape non alphanumeric characters. The type of protection of the network is set via the protection attribute. Valid values are WPA and WPA2. The alphanumeric password is set via the passphrase attribute. Setting a PSK directly is not supported as of now. The configuration can contain more than one <accesspoint> entry. In this case the driver will choose the network that offers the best quality from the list. To prevent the driver from auto-connecting to a network, the auto_connect attribute can be set to false. The bssid attribute may be used in addition to the ssid attribute to select a specific access point within one network. There is no backwards compatibility for the old configuration format. Users are advised to adapt their system scenarios. As an unfortunate regression, some 6xxx cards will not work properly. This issue is being investigated. The USB stack has a long history in the Genode OS framework. 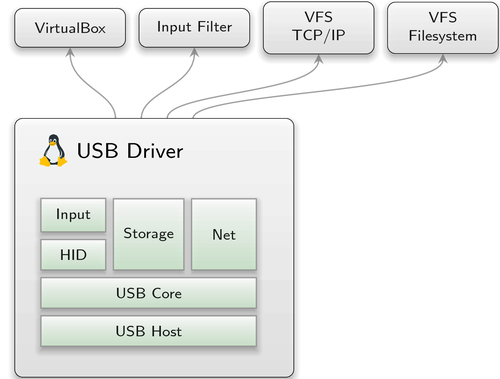 Back in May 2009, the first DDE-Linux-based driver was introduced, which was the USB input driver. It used compilation units related to the USB host controller, HID, and input subsystems of Linux. To other Genode components, it offered the input session interface. At that time the driver ran on 32-bit x86 machines only. Since then the USB driver underwent manifold alterations. It was extended to support different architectures (ARMv6, ARMv7, x86_64) and USB host-controllers of various platforms. The support for USB endpoint devices was extended by additional HID, storage, and network devices. Nonetheless, the USB driver remained a monolithic component comprising different session interfaces like block, NIC and input. Nevertheless, we always regarded the monolithic approach as an intermediate step towards a componentized USB stack, as can be seen in the release notes of 9.05. The first qualitative change of the USB landscape in Genode was the introduction of the USB session interface and its support by the DDE-Linux-based monolithic driver with the Genode release 15.02. It enabled the development of independent driver components for USB-connected devices. Simultaneously, the first self-contained driver was released for the Prolific PL2303 USB to UART adapter. More, independent, written-from-scratch drivers followed, supporting HID and USB block devices. The icing on the cake was support of USB sessions within VirtualBox introduced in May 2015. From that point on, it was possible to drive dedicated USB devices within a guest operating system. 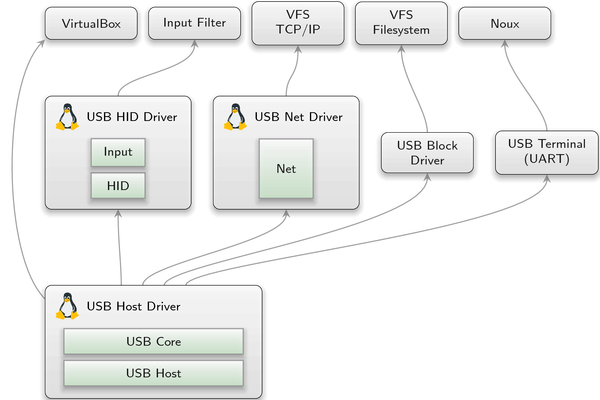 Nevertheless, the USB host-controller driver still contained the overall complexity of Linux' input, storage, network, and USB subsystems. This complexity is unfortunate because it inflates the trusted computing base of all its clients. When updating different DDE Linux based drivers to a more recent version, we finally took the opportunity to split the monolithic USB driver stack into several parts. By separating the USB controller driver from the actual USB device drivers, we significantly reduce the complexity of the USB resource multiplexing. You can find the new USB host-controller-only driver for different platforms (arndale, panda, rpi, wandboard, x86_32, x86_64) at repos/dde_linux/src/drivers/usb_host. During a transitional period, the new driver stack will exist besides the old one. Most run scripts still use the old variant but you can have a look at the scripts usb_block.run, usb_hid.run, and usb_net.run to get a notion of how to combine the new building blocks. to its configuration node. Like with the previous driver, one can use product_id and vendor_id, or bus and dev number attributes - delivered via the report - to define policy rules in the configuration of the driver. Thereby, different client drivers can access a dedicated device only. To ease up the migration to the new USB host driver, it is possible to just state the class number within a policy rule. A USB client-side driver then is able to open sessions for all devices of that class, but must use the correct label to address a unique device when opening the USB session. A possible driver configuration for the new USB host driver looks as follows. The new host driver does not need to be configured with respect to the kind of host controller used, e.g., OHCI, EHCI, XHCI. By providing the appropriate device-hardware resources to the driver, it automatically detects what kind of controller should be driven. The new self-contained USB HID driver is platform independent, as it solely depends on the USB-session interface. It comprises drivers for several kinds of HID devices. One can either enable support for all kinds of HID devices by one driver instance for compatibility reasons, or use one dedicated driver instance per HID device. To support all HID devices provided by the USB host driver, the HID driver can subscribe to a report of the host driver. When configuring the HID driver, like in the following snippet, it will track changes of a ROM called report, and open a USB session to all HID devices listed in the report. All options for tracking the state of keyboard LEDs like capslock, and the configuration values to support multi-touch devices are still supported and equal to the former monolithic driver. The self-contained USB network driver is called usb_net_drv and resides at repos/dde_linux/src/drivers. It supports different chipsets, but in contrast to the HID driver supports exactly one device per driver instance. If you need support for more than one USB connected network card, additional drivers must be instantiated. Like in the old monolithic driver, it is advised to state a MAC for those platforms where it is not possible to read one from an EEPROM, otherwise a hard-coded one is used. Devices like USB headsets, webcams, or sound cards require the assertion of a guaranteed bandwidth from the USB host controller in order to function correctly. USB achieves this through so-called isochronous endpoints, which guarantee the desired bandwidth but do not assert the correctness of the data delivered. Because Genode's USB-session interface lacked support for this kind of devices, we extended the interface and added support for isochronous endpoints in our host controller drivers. Additionally, we adapted our Qemu-XHCI device model to also handle isochronous requests seamlessly. With these extensions in place, it becomes possible to directly access, for example a headset, from a guest operating system within VirtualBox (e.g., Linux, Windows). We consider this feature as preliminary as the current implementation limits the support of isochronous endpoints to one IN and one OUT endpoint per USB device. Since Genode 18.05, we extended our support of Intel Ethernet NICs by another I219-LM variant and I218V. We also introduced I210 support including upstream fixes for boot-time MAC address configuration. The new dde_zircon repository provides a device-driver environment for the Zircon microkernel, which is the kernel of Google's Fuchsia OS. It consists of the zircon.lib.so shared library, which implements an adaption layer between Zircon and Genode, and the zx_pc_ps2 driver that serves as a proof-of-concept. Thanks to Johannes Kliemann for contributing this line of work! Once again we invested time into our PS/2-driver implementation due to compatibility issues with keyboards, touchpads, and trackpoints in recent notebooks. As a result, input devices of current Lenovo X and T notebooks as well as the Dell Latitude 6430u work solid now. In scenarios like Sculpt's runtime subsystem, a parent component may create a subsystem out of ELF binaries provided by one of its children. However, since the parent has to access the ELF binary in order to load it, the parent has to interact with the child service. It thereby becomes dependent on the liveliness of this particular child. This is unfortunate because the parent does not need to trust any of its children otherwise. To dissolve this unwelcome circular trust relationship, we simplified Genode's ELF loading procedure such that the parent never has to deal with the ELF binaries directly. Instead, the parent unconditionally loads the dynamic linker only, which is obtained from its trusted parent. The dynamic linker - running in the context of the new component - obtains the ELF binary as a regular ROM session provided by a sibling component. If this sibling misbehaves for any reason, the parent remains unaffected. To achieve this level of independence, we had to drop the handling of statically-linked executables as first-class citizens. In order to distinguish static from dynamic binaries, the parent needed to look into the binary after all. 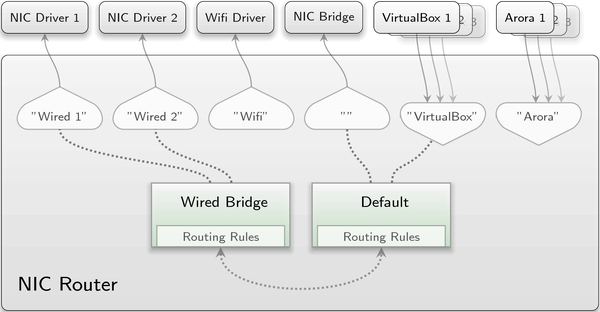 The main purpose of the NIC router is to mediate between an arbitrary number of NIC sessions according to user policies for the OSI layers 3 and 4. Once a NIC session is established and integrated into this mediation algorithm, the fact whether the NIC router is client or server of the session becomes reduced to subtleties that are transparent to the user. Though, when establishing the session, there exist some differences that must be reflected by the NIC router's configuration interface. As NIC session server, the router simply accepts all incoming session requests, given they transfer sufficient resources. We refer to these sessions as "downlinks". As NIC session client, on the other hand, the router is supposed to request the desired sessions - called "uplinks" - by itself and therefore has also to determine their session arguments in some way. The original version of the NIC router used a simplified model that was based on the assumption that there is either none or only one uplink. The existence of the one possible uplink was bound to the presence of a special domain named "uplink" in the configuration, thereby obviating the need for uplink-specific means of configuration. The domain attribute of the <uplink> node defines to which domain the corresponding uplink tries to assign itself. As you can see in the example, there is no problem with assigning multiple uplinks to the same domain or even uplinks together with downlinks. Independent of whether they are uplinks or downlinks, NIC sessions that share the same domain can communicate with each other as if they were connected through a repeating hub and without any restriction applied by the router. Similar to downlinks, uplinks are not required to stay connected to a certain domain during their lifetime. They can be safely moved from one domain to another without closing the corresponding NIC session. This is achieved by reconfiguring the respective domain attribute. An uplink can even exist without a domain at all, like the wifi uplink in the example above. In this case, all packets from the uplink are ignored by the NIC router but the session still remains open. Finally, an uplink and its NIC session client can be terminated by removing the corresponding <uplink> node from the NIC router configuration. By default, the ICMP echo server is enabled. So, in the example above, it is enabled for all NIC sessions assigned to domain "one" and "four". This implies that the router will answer ICMP echo requests from sessions that target the IP address of the corresponding domain. For the domains "two" and "three", the ICMP echo server is disabled, meaning, that they will drop the above mentioned requests at their NIC sessions. This feature is disabled by default. So domain "one" and "four" won't log dropped packets whereas domain "two" and "three" will. A dropped packet message is accompanied by the rationale that led to the decision. The architecture and philosophy of Genode mandates that network protocol stacks be moved up and away from the kernel whenever practical. Eliminating the TCP/IP stack from the TCB of non-networked components has obvious benefits, but poses a challenge for isolating or sharing IP stacks otherwise. In version 17.02, we introduced a BSD-sockets API layer to the POSIX C runtime that uses the local virtual-file-system layer to access an abstract TCP/IP stack via control files. A stack may be instantiated locally or shared via the File_system service. 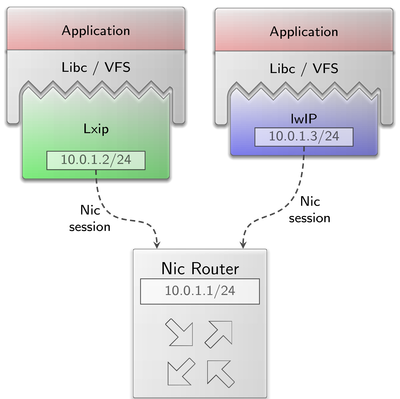 The first stack plugin for the VFS layer was a port of the Linux IP stack, referred to as LxIP. Ported in the 9.11 release, LwIP is a lightweight alternative to LxIP. It features a low-level asynchronous interface as well as an optional implementation of the BSD-sockets API. In this release, we updated LwIP to the latest version, reconfigured it for asynchronous mode only, and use its low-level API in the new LwIP VFS plugin. This plugin retains the modest resource usage of the LwIP library with performance that is competitive with LxIP. The previous LwIP port has been renamed to lwip_legacy and is scheduled for removal. Developers and integrators are encouraged to transition from the old libc_lwip libraries to the new VFS plugin by simply removing the legacy libraries from components and updating configurations to load and configure the plugin at start time. Since version 17.05, the init component supports the dynamic adjustment of RAM quota values. But this mechanism remained unavailable for capability quotas. This became a limitation in use cases like Sculpt's RAM file system where an upper bound of needed capabilities is hard to define. For this reason, init has gained the ability to adjust capability quotas of its children according to dynamic configuration changes. We overhauled the way the libc acquires DNS server information. Instead of simply accessing the commonly used /etc/resolv.conf file it now inspects the file given by the nameserver_file attribute to retrieve the DNS name server address. It defaults to /socket/nameserver which is the common location when using the lxip or lwip VFS plugin. As a constraint the libc will read the first line and expects the verbatim name-server address. The fs_rom server has long been part of the foundation of dynamic Genode systems, both for serving configuration and loading component binaries and libraries. For the server to dynamically update ROM dataspaces as requested by clients it must maintain independent dataspaces for each client. This is a small price for dynamic configurations but a burden when serving more than a few static binary images. The new cached_fs_rom server is an alternative ROM service that deduplicates dataspaces across client sessions as well as load and deliver sessions out-of-order. Implementing the cached_fs_rom component required an amendment to the RM session interface to support read-only attachments in managed dataspaces. This allows the server to allocate a managed memory region for each session, map the dataspace with file content into the region without write permissions, and finally hand out a dataspace capability for this region to its client. This is the prerequisite for safely delegating shared memory across clients. Note that granting access to such a component would of course allow a client to discover which files have been loaded by other components by measuring the round-trip time for session requests, but this discovery is mitigated in Sculpt OS by restricting components to a ROM whitelist. Under these conditions a component may only determine if a component with a similar whitelist has been loaded previously, but only for ROMs that have not been loaded by the dynamic linker before measurements can be taken. The previous release added a long anticipated feature plugin for the VFS layer, the Copy-On-Write plugin, or COW. This plugin transparently forwards write operations to a read-only file to a writable file in a different location, such as initial disk images for virtual machines. The implementation appeared to provide these semantics without sophisticated knowledge of what portions of a file-system had been duplicated for writing, but in practical use the plugin suffered from a number of issues. First, the plugin was not able to reliably detect recursion into itself, and second, chaining asynchronous operations together proved to be more complicated than we had planned for. With a look on the features we were using rather than the features we anticipated, we focused on the initial content feature of the ram_fs. This server provides a non-persistent file-system that can be populated with content before servicing clients. To foster the goal of providing a toolkit of orthogonal components we have been gradually merging the ram_fs server, the first file-system server, into the newer, more powerful vfs server. Initial population happened to be the last feature before parity, so we created a special import plugin for the VFS library that instantiates a temporary internal file-system that is copied to the root of the main VFS instance. The copy is recursive and non-destructive by default. Should the import process need to overwrite existing files, overwrite="yes" may be added to the plugin configuration node. This plugin covers all use cases we have for the COW plugin and turned out to be quite intuitive. Therefore, with this release, the COW plugin is replaced by the import plugin. Genode's runtime for the Ada programming language has been extended with exception support for C++ interfacing. Ada exceptions can now be caught in C++ and provide type and error location information when raised. Further improvements are runtime support for 64-bit arithmetic and some minor fixes in Gnatmake's include paths. Thanks to Johannes Kliemann for these welcome improvements! During this release cycle, a simple SSH client was added to the world repository and we quickly noticed that our graphical terminal was unprepared for the variety of terminal escape sequences found in the wild. The escape sequence parser in the terminal server is now able to handle or ignore the litany of sequences that might be considered part of the ad hoc VT100/Screen/Xterm standard. We may never be able to say that we handle them all, but the terminal server is now compatible with most robust TUI applications. Thanks to the work of Johannes Schlatow, Python 3 has become available at the Genode-world repository. It supersedes Genode's original Python 2 port, which is scheduled for removal now. The Python 3 port is accompanied with the python3.run script for a quick test drive. 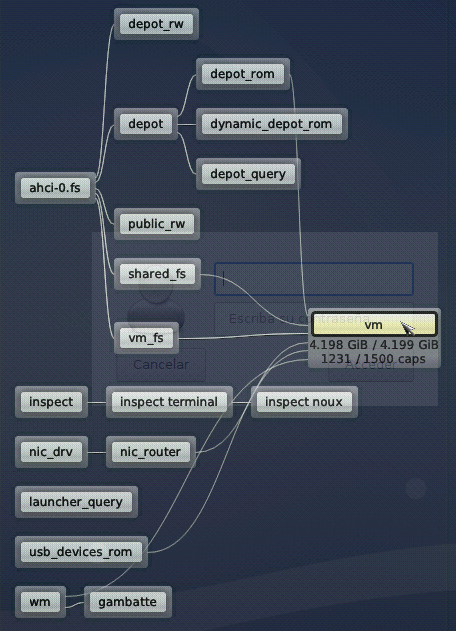 It also features depot-archive recipes, which in principle enable the deployment of Python 3 within Sculpt OS. There are situations where a security critical application needs to obtain information stored on a file system but must not depend on the liveliness of the file-system implementation. A prominent example is the sculpt manager of Sculpt OS. Instead of accessing file systems directly, it uses a helper component that performs the actual file-system access and generates a report containing the aggregated information. Should the file system crash or become unavailable for reasons such as the removal of a USB stick, the helper component may get stuck but the security-critical application remains unaffected. The new fs_query component resides at repos/gems/src/app/fs_query/ and is accompanied with the fs_query.run script. The file system is configured as a component-local VFS. The component accepts any number of <query> nodes within its <config> node. Each <query> node must contain a path attribute pointing to a directory to watch. The component generates a report labeled "listing". For each existing directory queried, the report contains a <dir> node with the list of files as <file> nodes featuring the corresponding name as an attribute value. A <query> can be equipped with a content="yes" attribute. If set, the content of the queried files is supplemented as body of the <file> nodes. The reported content is limited to 4 KiB per file. If the content is valid XML, the <file> node contains an attribute xml="yes" indicating that the XML information is inserted as is. Otherwise, the content is sanitized. We have updated our port of the ACPI Component Architecture (ACPICA) from version 2016-02-12 to the most recent release version 2018-08-10. This was motivated by recent notebooks that apparently were not supported well by the old version. According to the ACPICA documentation, this update mainly marks the step from ACPI specification version 6.1 to 6.2 and, as hoped, our problems with modern laptops got fixed too. We updated the VirtualBox 5 port on Genode to the latest available 5.1 version (5.1.38). Applying CPU microcode patches is a common task for the UEFI/BIOS firmware shipped by hardware vendors of PCs and/or motherboards. For various reasons, however, machines may not receive firmware updates as often or as quickly as they should. Based on the recent high rate of disclosures for Spectre-related hardware bugs in CPUs, there is the desire to use microcode updates as rapidly as they are released. To address this concern, we added principle support for applying Intel microcode patches as part of the Genode framework. The first step was to add support to download the Intel microcode patches via the Genode port mechanism. As next step, a Genode component, showcased by repos/ports/run/microcode.run, can compare the current microcode patch level on Genode/NOVA with the downloaded Intel microcode. The relevant information about the CPUs and their microcode patch level are provided by the platform_info ROM on Genode/NOVA. The microcode update functionality has been integrated into the tool/run/boot_dir/nova support file and can be enabled by providing a apply_microcode TCL procedure as showcased in repos/ports/run/microcode.run. We developed the microcode chained bootloader as part of the Morbo project. It checks for an Intel CPU and a valid micro.code module that matches the currently running CPU. Afterwards, the bootloader looks up all CPUs and some LAPIC information by parsing the relevant ACPI tables. With this information, the CPUs are booted to apply the microcode update to each processor. On CPUs with hyperthreading enabled, it is effectual to start a single hyperthread per CPU to apply the update. Finally, all previously started CPUs are halted and the microcode bootloader hands over control to the next module which is typically the x86 kernel. As announced on this year's roadmap, we extended our hw kernel on x86 with multiprocessor support. The bootstrap part of the kernel now parses ACPI tables to obtain the required CPU information and finally starts them. The number of the running CPUs is reported by bootstrap to the hw kernel to foster the x86 case, where the maximum supported number of CPUs is not identical to the number of running CPUs. This is in contrast to our supported ARM boards where both numbers are the same. The NOVA kernel branch in use has been switched to revision r10, which is an intermediate result of Cyberus Technology and of Genode Labs to harmonize their independently developed NOVA kernel branches. We hope to mutually benefit from the evolution of NOVA over the long run by having a common NOVA trunk and short individual branches. Export kernel trace messages via memory, which can be used by Genode for debugging purposes. The feature is used in Sculpt OS already and may be tested by repos/os/run/log_core.run. Cross-core IPC via NOVA portals can now be restricted. In the past, we repeatedly encountered problems with kernel object destruction when using Genode on top of the Fiasco.OC microkernel. The effect was a non-responsive kernel and halt of the machine. Thanks to recent development of the Fiasco.OC/L4Re community, those problems seem to be solved now. Jakub Jermar gave us the hint to update to a more recent kernel version, which solved the observed issues. Now, the Genode fork of the Fiasco.OC version is based on the official Github sources from June 25, 2018. The L4Re parts that are used by Genode, namely the sigma0 and bootstrap components, are still based on the official subversion repository, referring to revision 79. Genode's run tool automates the workflows for building, configuring, integrating, and executing system scenarios. We refined the run tool by removing the check_installed and requires_installation_of functions. They were used to determine if a certain shell command was present on the host system and are now superseded by the installed_command function. This new function also checks if a shell command is present on the system by searching the PATH variable and additionally the sbin directories that might not be part of the PATH on some Linux distributions. If a shell command cannot be located, a warning message will be given and the run script will be aborted. Executing a run script on Genode yields the creation of image files (e.g., image.elf, <run-script>.img ...). These image files are created from a temporary directory under <build_dir>/var/run/<run-script>/genode, where the Genode components required by the run script are being stored. After image creation, it becomes difficult to determine the set of components present in a certain image. Therefore, we added a new run option for our RUN_OPT environment variable called –preserve-genode-dir, which leaves the temporary genode directory intact. This way all Genode components of an image file can be inspected with ease. Note that this option inflates the size of the resulting boot image because the content is contained twice, once in the image.elf file and once in the genode/ directory. Boot time may vary vastly between PCs. This is particularly troublesome when AMT Serial-Over-LAN is the only debug option for different test machines. Because Intel ME is quite picky at which time window AMT SOL connects, it may just fall flat. So, we added a run option to optionally change the default AMT boot timeout of 5 seconds like follows. On some PCs, we had to increase this option up to 26 seconds, which may further increase with attached USB mass storage if USB boot is enabled.